With the weather getting warmer my creative juices have started flowing. One of my passions is Asian cuisine. In the past I’ve worked my way through Japanese,Chinese,Korean and Thai cuisine and most recently my culinary adventures have taken me to southeast Asia and in particular Vietnam. Vietnamese cuisine, in general, is characterized by the use of fresh meats and vegetables flavored with fish sauce (nuoc mam), along with a variety of fresh herbs. Each dish strives to achieve a balance between five elements. They are spicy,sour,bitter,sweet and salt. For my fourth “Meatless Friday” I decided to prepare a Vietnamese Rice Noodle salad. While a lot of Vietnamese dishes are very spicy I decided to leave out the peppers. What I didn’t leave out is flavor. The balance between sweet, salt and sour along with fresh cilantro creates a salad that is remarkably refreshing. For protein I have added some cooked shrimp and crushed peanuts. Place to rice noodles in a pan and cover with boiling water. When softened drain and set aside. Combine all dressing ingredients. Stir until sugar is dissolved. 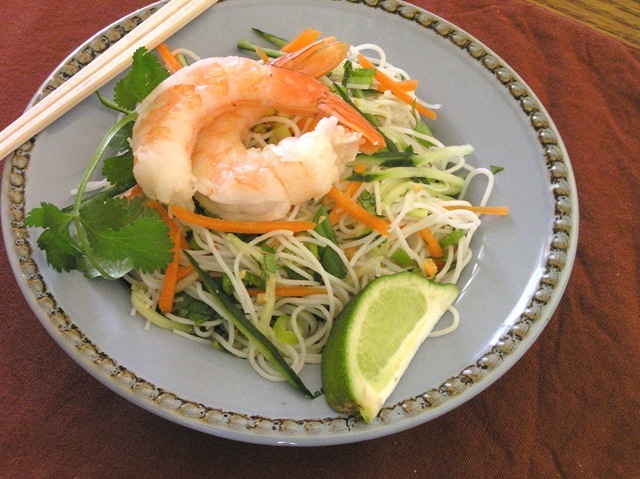 Toss the noodles, vegetables,peanuts and shrimp with the dressing and serve with a wedge of lime on the side. This should make 2 entree size salads or 4 appetizer size. If you like you spice add a teaspoon or so of sambal or a diced jalapeno. To make this Vegetarian/Vegan just leave out the shrimp. I didn’t have any fish sauce so I used soy. The change ( and the omission of the shrimp) also makes this a Vegan dish. Reblogged this on Detroit Eats. This looks absolutely scrumptuous, and I am totally in love with Vietnamese flavors. Thanks for this! Glad you enjoyed it. Thanks for stopping! This looks really good. I especially like that you included cilantro and peanuts. Cilantro is traditional and I wanted to add the peanut for protein. This salad looks beautiful. I’m with you, I’m a huge fan of Asian foods. I’m finding that the best recipes have the least ingredients. A lovely salad. Unfortunately fish sauce is not available here. I see you list soy sauce as an alternative. Would oyster sauce work as a substitute as well? As much as I love Oyster sauce I might be concerned that it would change the character of the dish. I think the soy would work better. Looks good, Ed – we will be making it this week. I am confident you will enjoy it!! I love how fresh and light this dish sounds. I’ve saved it for the future! Once you taste it it wll become a staple!